Excellent! I will mark both of you down! Martin, I will send the link to Beat. Thanks for providing this! Martin, Beat said that he would add the sensor to his list but not on the top. He isnt revealing his progress at this time for some reason or another so, when I get the information I will post it here. Will do! We're definitely getting towards our goal of 50 boards. Toxnix emailed me and said he wanted one as well! As a regular user of a DistoX using one of the boards which Beat made a couple of years ago I just wanted to comment on the value of bluetooth. While the DistoX on it's own is a highly useful instrument, it is only so when calibrated. This is not difficult, but does require a PDA and bluetooth link to process the calibration readings and calculate the calibration data to upload back into the DistoX. Also the electronic drawing up as you survey using the PDA has totally changed my world with surveying, and I was very sceptical at first. But once I tried it I find it so much better than paper and pencil. I would recommend anyone who has not tried it and has the chance to give it a go. Footleg wrote: As a regular user of a DistoX using one of the boards which Beat made a couple of years ago I just wanted to comment on the value of bluetooth. While the DistoX on it's own is a highly useful instrument, it is only so when calibrated. This is not difficult, but does require a PDA and bluetooth link to process the calibration readings and calculate the calibration data to upload back into the DistoX. Unfortunately, I have not used a Disto X before but just by reading other posts and Beats information on his site, I can really tell how this one intrument could change the world of surveying as we know it. I'm very interested to see this next version come out. Unlike the DUSI (Which is no longer in production) and the SAP (Which is outragous in its pricing) the Disto X is fairly affordable and it can take all 3 measurements with the press of a button. Not only that but if you had a PDA handy that has bluetooth, the measurements would automatically be transferred to the PDA in seconds and the line plot will be drawn for you. Afterwards you can simply do a few splay shots from the stations and practically play connect the dots with the end point of all the splay shots. The same works for cross sections. If you really took the time you could create a virtual 3D map of the entire cave. The crazy thing is you could possibly create that 3D map in the same amount of time as you would have produced a 2D map with the standard Suunto! 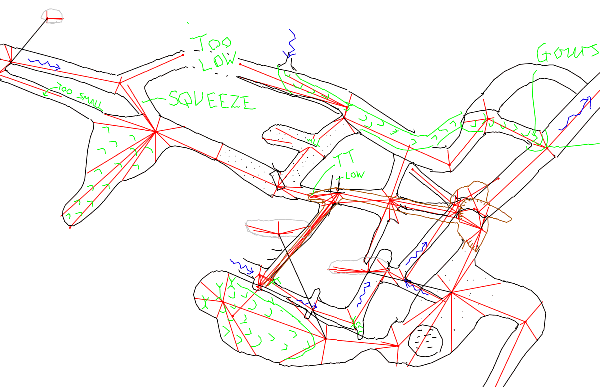 It is great being able to sketch to scale on an automatically plotting centerline and to leave the cave with a completed scale sketch ready to drop into whatever drawing software you use for your final maps. Here is a sample of a sketch I drew during a survey trip last year. This is straight off the PDA (exported as an autocad dxf file, but turned into a bitmap here in order to display in this post. 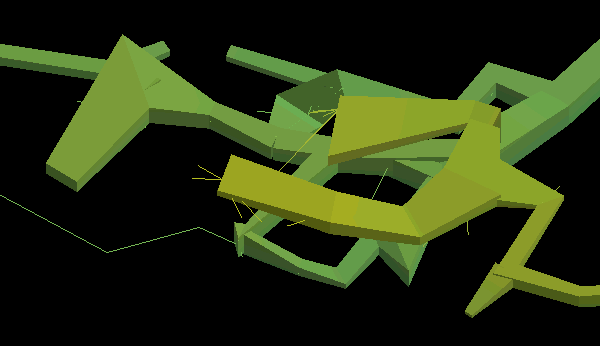 And here is the 3D model generated from the centerline data which was exported from PocketTopo. All the data was captured from the DistoX without a single number having to be typed in anywhere. So transcription errors are eliminated, not to mention a whole lot of typing that did not need to be done. Wow Footleg, that Google Map is beyond amazing! I'd love to know how you guys did all that, as the end result is truly impressive. rlboyce wrote: Wow Footleg, that Google Map is beyond amazing! I'd love to know how you guys did all that, as the end result is truly impressive. The basic creation of a caving googlemap is a bit technical, but not too difficult. The generation of the data to display is a different matter! I learned a lot of the basics of googlemap creation from the excellent Mendip Caves map created by another British caver Bill Chadwick and the additional help pages Bill produced. There are plenty of resources on the internet about general googlemap creation too. Start with the google's own map api help pages. Producing the marker positions and survey overlays is a product of many years work surveying the area in question and drawing up surveys. It really helps that this data can be made freely and publicly available including the entrance positions. I realise this is a problem in most cases in the US. But you could produce a private offline map all the same. But you need the entrance coordinates for the markers, and the surveys for the map overlays. The difficult part was getting all the surveys into bitmaps which were aligned and scaled correctly on the tile grid which googlemaps uses. But once I had that cracked it is simply a matter of editing these bitmaps to update the surveys as discoveries are made, and then running a script to cut them up into tiles to upload to the website. Excellent work! Nice to see some other examples of work in action! Looks like it's a rather complex process to follow in order to get your map onto googlemaps. I would like to add Alain Bélanger to the list of buyers. I have not heard anything back from Beat Heeb about any progress or anything since the last update. I'm starting to get a bit concerned. However, I'm sure he's just busy with his actual job and everything else. I'm sure he will give me an update when he has an update. "I just finished a first prototype with a Leica DXT and a new board. Based on the few tests I made so far I think the new sensors are good. However I am not convinced of the current mechanical construction. I have to make a revised design. Bluetooth chip. It could be difficult to find an alternative for this.